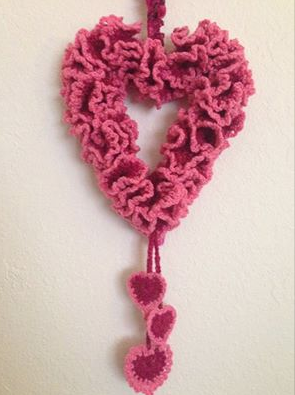 You can make large wreaths with your crochet hook to be in any shape you want. For Christmas, using a coat hanger is easy to shape into a circle and crochet around it. I love it when our fans get an idea and personalize it to make it their own. Lynn Niehaus, fan of The Crochet Crowd, saw a different concept in one of the patterns I made. Instead of making a predictable round wreath, Lynn bent her wire to look like a heart instead. Using pink, she created a fun new wreath design. She another heart pattern and added them as danglers. She made hers for Valentines Day. You can do the same thing with our Table Top Wreaths. The only difference is that the circumference of the wreath is much bigger. I actually have two large wreaths in my Christmas Holiday Decor. One in green and one in pink. Fasten onto ring, SC around the ring. Do it tight enough so that the stitches are covering all of the wire. It doesn’t need to be compressed extremeley tight. Just enough to ensure the wire is covered. SL ST when you get back to the start. CH 3, then DC 3 Times into each stitch going around the ring. SL ST at the end to the top of the CH 3. CH 3, then SC into the next stitch, *CH 3, SC into the next stitch. Repeat * all the way around. SL ST at the end.